Welcome to the World of 3D printing! 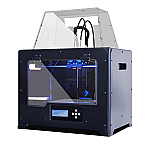 FlashForge USA is disrupting the desktop 3D printing market by introducing easy-to-use 3D printers. Established in 2011, FlashForge has sold over thousands of 3D printers worldwide, including the award-winning Creator with dual extrusion. FlashForge USA focuses on making 3D printing widely accessible to institutions, architects, engineers, designers and the broad consumer and prosumer market. FlashForge USA is fully committed to creating value for its customers by delivering quality, reliable, competitively-priced products and going beyond the FlashForge Promise.